* Selected by Indie Booksellers for "Indie Notables"
"Dr. George Tiller Saved My Life…and My Baby's Life"
Oprah Magazine "25 BEST BOOKS OF SUMMER"
Alice Cohen was happy for the first time in years. After a difficult divorce, she was engaged to a wonderful man, she was raising a beloved adopted daughter; and her career was blossoming. Then she started experiencing mysterious symptoms. After months of tests, X-rays, and hormone treatments, Alice was diagnosed with an abdominal tumor and sent for an emergency CAT scan that revealed the cause of her symptoms. She was six months pregnant. At age 44, with no prenatal care and no insurance coverage for a high-risk pregnancy, Alice was inundated with opinions from doctors and friends telling her what was ethical, what was loving, what was right. 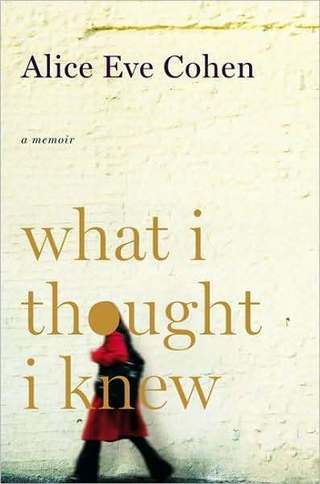 With the suspense of a thriller and the intimacy of a diary, Cohen describes her unexpected odyssey through doubt, a broken medical system, and the complexities of motherhood and family in today's world. Ruefully funny, wickedly candid, What I Thought I Knew is a mystery, a love story, a philosophical quest and a personal tour de force.